Provides the interface for Page controls. Controls are also referred to as components or widgets. When a Page request event is processed Controls may perform server side event processing through their onProcess() method. Controls are generally rendered in a Page by calling their toString() method. Control HTML HEAD elements can be included in the Page by overriding the getHeadElements() method. Click supports two ways of deploying pre-configured resources. The recommended deployment strategy (which also the simplest) relies on packaging resources into a special folder of the JAR, called 'META-INF/resources'. At startup time Click will scan this folder for resources and deploy them to the web application. 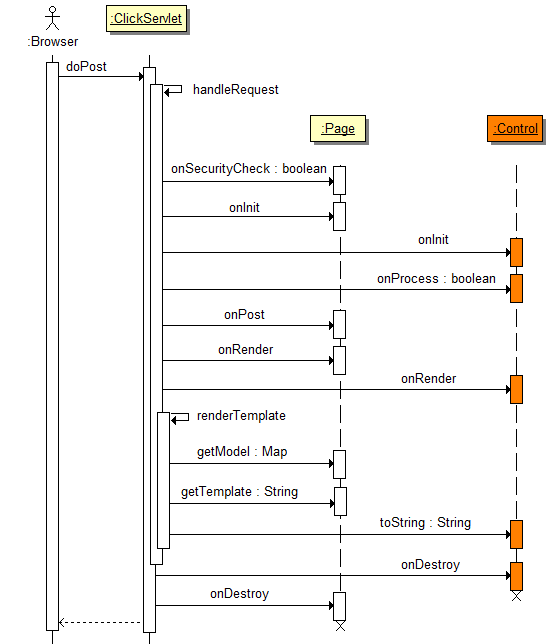 This deployment strategy is the same approach taken by the Servlet 3.0 specification. Please see the section Deploying Custom Resources for more details. An alternative approach to deploying static resources on startup is provided by the Control interface through the onDeploy(ServletContext) method. Please note AbstractControl provides a default implementation of the Control interface to make it easier for developers to create their own controls. The global control messages bundle name: click-control. Returns the list of behaviors for this control. Return HTML element identifier attribute "id" value. Return the localized messages Map of the Control. Return the parent of the Control. Returns true if this control has any Behaviors registered, false otherwise. The on deploy event handler, which provides classes the opportunity to deploy static resources when the Click application is initialized. The on initialize event handler. The on process event handler. Render the control's HTML representation to the specified buffer. Set the parent of the Control. Return the Page request Context of the Control. Controls can contribute their own list of HEAD elements by implementing this method. One can also add HEAD elements from event handler methods such as onInit(), onProcess(), onRender() etc. Set the controls event listener. Return the name of the Control. Each control name must be unique in the containing Page model or the containing Form. Please note: a common problem when overriding onDeploy in subclasses is forgetting to call super.onDeploy. Consider carefully whether you should call super.onDeploy or not. The on initialize event handler. Each control will be initialized before its onProcess() method is called. Container implementations should recursively invoke the onInit method on each of their child controls ensuring that all controls receive this event. Please note: a common problem when overriding onInit in subclasses is forgetting to call super.onInit(). Consider carefully whether you should call super.onInit() or not, especially for Containers which by default call onInit on all their child controls as well. The on process event handler. Each control will be processed when the Page is requested. ClickServlet will process all Page controls in the order they were added to the Page. Container implementations should recursively invoke the onProcess method on each of their child controls ensuring that all controls receive this event. However when a control onProcess method return false, no other controls onProcess method should be invoked. When a control is processed it should return true if the Page should continue event processing, or false if no other controls should be processed and the Page.onGet() or Page.onPost() methods should not be invoked. Please note: a common problem when overriding onProcess in subclasses is forgetting to call super.onProcess(). Consider carefully whether you should call super.onProcess() or not, especially for Containers which by default call onProcess on all their child controls as well. The on render event handler. This event handler is invoked prior to the control being rendered, and is useful for providing pre rendering logic. Container implementations should recursively invoke the onRender method on each of their child controls ensuring that all controls receive this event. Please note: a common problem when overriding onRender in subclasses is forgetting to call super.onRender(). Consider carefully whether you should call super.onRender() or not, especially for Containers which by default call onRender on all their child controls as well. The on destroy request event handler. Control classes should use this method to add any resource clean up code. Container implementations should recursively invoke the onDestroy method on each of their child controls ensuring that all controls receive this event. Please note: a common problem when overriding onDestroy in subclasses is forgetting to call super.onDestroy(). Consider carefully whether you should call super.onDestroy() or not, especially for Containers which by default call onDestroy on all their child controls as well. Render the control's HTML representation to the specified buffer. The control's Object.toString() method should delegate the rendering to the render method for improved performance. the list with this control behaviors. In order for a Control to be considered as an Ajax target it must be registered through ControlRegistry.registerAjaxTarget. When the Click handles an Ajax request it iterates the Controls registered with the ControlRegistry and checks if one of them is the Ajax target by calling isAjaxTarget. If isAjaxTarget returns true, Click will process that Control's behaviors. Please note: there can only be one target control, so the first Control that is identified as the Ajax target will be processed, the other controls will be skipped. Not every scenario can be covered through an ID attribute though. For example if an ActionLink is rendered multiple times on the same page, it cannot have an ID attribute, as that would lead to duplicate IDs, which isn't allowed by the HTML specification. Control implementations has to cater for how the control will be targeted. In the case of ActionLink it might check against its id, and if that isn't available check against its name.